While depression was once viewed as mere sadness, today we recognize that it is a biochemical disorder that can often be treated with medication and therapy. Unfortunately, the wide range of available depression medications sometimes fails to help patients who are suffering from this disease. New research has found that combining antidepressants with omega-3 fatty acids and other dietary supplements may be the answer for many people. One of the main challenges in treating depression is that people often see only slight improvement, or even no improvement at all. Treatment-resistant depression is defined as clinical depression that does not respond to two or more different medications. Researchers and physicians have very little understanding of why some people respond to medication while others do not. It is believed to be a combination of genetic and environmental factors. Despite huge advances in the pharmaceutical world, only half of all patients who treat depression with antidepressants alone achieve complete recovery. Even people who eventually respond to antidepressant therapies often find that it is a long process and that the medications at times only partially treat their symptoms. Because depression is a devastating illness, this can make life uncomfortable and even unbearable. For this reason, researchers have been searching for new approaches that combine antidepressants with other therapies and lifestyle changes. This study looked at interactions between omega-3 fatty acids, S-adenosylmethionine (SAMe), methylfolate and Vitamin D with common antidepressants such as SSRIs. The results were surprising; these other health supplements may be the key to effectively treating depression in cases where medications alone are not enough. When taken with antidepressants, these supplements were shown to boost the effect of the medication, allowing more patients to gain relief from their symptoms. Omega 3 and antidepressants together were an especially effective combination, working better than the combination of pharmaceuticals and talk therapy. What does this mean for depression treatment? Patients soon may find successful treatment who otherwise would have struggled with an incompletely treated disease. Because omega-3 fatty acids are considered part of a healthy lifestyle, there is absolutely no risk for most people. Depression is not the only disorder in which a combination of supplements and pharmaceuticals often proves the most effective treatment. 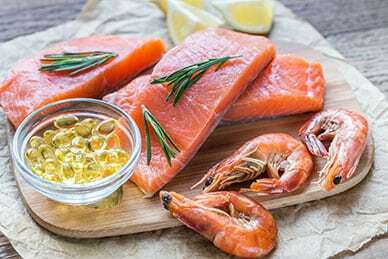 In particular, omega-3 fatty acids have been found to help with a variety of diseases and health complaints, from heart disease to type 2 diabetes. Commonly found in fish and nut oils, these fatty acids are believed to work by reducing inflammation and subduing autoimmune activity. Their exact effect on depression is still unknown, but inflammation appears to play a vital role in the development of clinical depression. While the mechanism will need to be studied further, these oils appear to be effective when combined with traditional pharmaceutical remedies. Omega-3 fatty acids are just one supplement that has been recently found to be effective as an adjunct treatment for depression. Researchers and medical professionals are constantly finding new ways that diet, exercise, supplements and other lifestyle changes can have a positive effect on mood and overall health. Not only may they help protect against disease, but they may prove helpful in treating certain conditions as well. Healthy living remains the best medicine for a wide variety of disorders. Omega 3 and antidepressants may work synergistically to stop depression in its tracks where nothing else helps. While no one should change medications without talking to their physician, this discovery may offer hope to the millions of people who suffer from clinical depression that does not respond completely to common medications.